As spring encroaches in fits and starts, it’s time to think of ways to boost your pollinator habitat. One thing that’s not so easy to do here in the southwest because of the lack of water, is grow wildflowers. But if you are able to keep one little patch watered, the honey is amazing, and bees love native wildflowers. Check the packet to make sure they are New Mexico drought resistant. If you live in the Midwest or big Ag areas, hand the article below to farmer Joe or your neighbor. You know, the ones who insist on spraying his/her crops or backyard with neonicotinoids or using systemically treated pest resistant plants. Sad reality: those systemically treated plants also kill the good guys, our pollinators. Over time, they sicken bugs and humans alike. 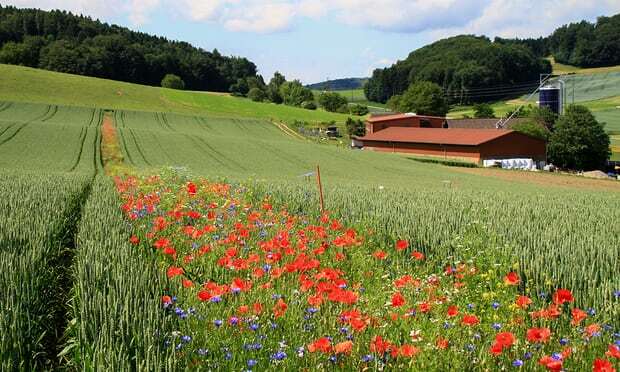 But according to a recent report from the Guardian, ringing fields with wildflowers isn’t quite as effective as it could be considering that the beneficial bugs are only eliminating destructive pests on the outskirts of fields and not toward the center, where there’s an even greater abundance of crop-damaging free meals for the taking. After all, why would a perfectly content bug travel out of its way for an tasty aphid snack when it doesn’t really have to? “If you imagine the size of a [ground beetle], it’s a bloody long walk to the middle of a field,” explains Richard Pywell of England’s Centre for Ecology and Hydrology (CEH)…And so, Pywell and his colleagues have launched a literal field study that’s more or less a no-brainer when it comes to broadening the range of pest-munching predatory insects: extending the rows of wildflowers inside the fields, in lieu of simply limiting bug-attracting blooms to the periphery. The brightly colored floral strips planted as part of a five-year test-run at 15 farms across eastern and southern England are only six meters (a little under 20 feet) wide. The strips take up a mere smidge — roughly 2 percent — of valuable cropland when spaced about 100 meters (328 part), a distance that allows for pest-eradicating insects to better infiltrate the fields and do what they do best.